The Point/Isles area, less than two-miles-square, has a commonality of lying on the most western tip of the Pass Christian peninsula, remaining un-annexed within the jurisdiction of Harrison County. Through the years, the homeowners have bound themselves together in common causes such as fighting annexation and encroachments of gaming interests. They formed their own water and sewer district and fire department. Located west of the City of Pass Christian, Highway 90 separates the major subdivisions of Henderson Point from Pass Christian Isles. The only distinction between the two is that the Isles is exclusively residential, while the Point has a small commercial district that consists of less than ten enterprises, two large Condominium developments, and home to the spacious Gulfshore Baptist Assembly Campus. 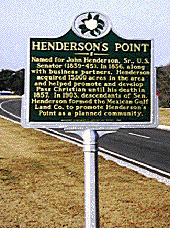 Beginning in 1836, John Henderson, Sr., was one of three of the original large land holders of the Pass Christian peninsula. The Realty Combine owned lands that extended from the Bay of St. Louis eastward to the middle of present day Long Beach. Within a few years after the dissolution of that partnership, Henderson began trading out his holdings in order to aggregate them within the lengthy expanse from the Bay of St. Louis to Donlin Avenue, excluding the Charlot Tract, now the center of town area. John Sr.'s son, Elliot, like his father, became an ardent promoter of Pass Christian as is indicated by the many sales transactions in Harrison County Deed Records. Along with Elliot, in 1903, his nephew, John Leland Henderson, Secretary of the Mexican Gulf Land Co. advertised the benefits for the sale of lands in what was the vastly unsettled Henderson's Point. John “Leland” lived in Bay St. Louis -- while his uncle, Elliot, the company's president, lived in Henderson's Point. They promoted the area as the only remaining undeveloped tract of land between New Orleans and Mobile having immediate access to rail transportation. Henderson’s Point was described as having 15,000 beachfront feet along the Bay of St. Louis with new wide streets being planned, including plenty of parks, and regular street blocks composed of large lots. An anchorage basin would be dredged for boat harborage adjoining a proposed club house including a street car line that would extend to Pass Christian and which would provide transportation to Gulfport and Biloxi. Leland promised that it would be a planned community. 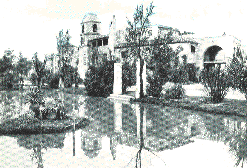 Following a Hurricane in 1906, and other setbacks, the Henderson dream of growth and promotion had slowed to a halt. Elliot died in 1913, at age 80, and John Leland Henderson had returned to Oregon. Elliot had no children, so he deeded his vast holdings to the Hewes Brothers of Gulfport, nephews of his wife Fanny Hewes, who followed Elliot in death a few months later. It was left to Finley Hewes to become the predominant shaper of the company until the real estate holdings were sold. In mid-1926, a $6,000,000 – 1400-acre development of Henderson Point again came alive, and was named Pass Christian Isles when it was headed by Allen Johness. Seven miles of canals and lagoons were dug while the marsh areas and low points were filled with dredged material resulting in the Bay shoreline being set at a minimum height of 12-feet above sea level. The Pass Christian Isles Company was also in process of negotiating with investors to build a first class resort hotel that would be located on the beach. (The reality of these plans was the Inn-by-the-Sea which carried through with the proposed Mediterranean architectural motif. The venture received a modicum of success, but once more economic failures occurred with the arrival of the Great Depression of the 1930's — which like many real-estate ventures of the day — went into bankruptcy. It wasn’t until 15 years later, in 1946, when the Wallace C. Walker Land Company bought the failed operation from the New Orleans Canal Bank. Walker established the Sunset Realty which set renewed priorities by having re-surveyed the land, modified the plats, and sub-divided the area into two subdivisions called Henderson Heights and Pass Christian Isles.  Along with promotions, salesmen were engaged to aggressively promote lot sales and home sites. An 18-hole Golf Course was constructed which in 1952, was spun off to the newly formed PCI Golf Club. The large area north of Boisdore (Malini) Bayou was also spun off to other developers and this was renamed Timber Ridge, later Bay Colony, and then, once more, named Timber Ridge. The Golf clubhouse and a large part of the golf greens are situated in Timber Ridge. Bayou Boisdore was named by the early French, meaning Golden Woods for the many trees that were strewn along the waterway. Later, when a large tract was settled by Philip Malini, the trees were used in his lumber mill and boatyard. Today, the bayou is called both Malini and Boisdore. An English map of the Henderson Point area dating to 1778, shows ruins of earlier habitation. In 1928, Annie’s Place opened as a drive-in, serving sandwiches and soda to the tourists who stopped off from the old wooden bridge that was then part of the link along Highway 90. It was opened and operated by “Big Annie” and her husband “Poppa Sam” Pagano. In 1937, the son and daughter dancing team of Annie and Sylvester Pagano, were winners of the “Big Apple” and “trucking” dance contest held at Uncle Charlie’s Night Club in Bay St. Louis. In 1939, the Drive-In was moved out of the street to the Pagano lot and underwent a major change with a stucco facade that replaced the original frame house. This was the same year that Annie Jacqueline Pagano graduated from St. Joseph High School in Pass Christian. As a present from her parents, she was given a graduation open-house and dance hosted at their Henderson Point restaurant. By 1940, Annie’s was well established, even after it had been destroyed by fire in 1932. Over the years, the restaurant suffered even more disasters -- by hurricanes that occurred in 1947, 1965, and again in 1969, when it took the brunt of the path of Camille. In 1960, retired owner of Annie’s Restaurant, Gaetano Sam Pagano, died. Having been born in Italy, Sam lived in Pass Christian for 50 years. He had two daughters, Mrs. Annie Lutz and Mrs. Catherine Luce, and two sons, Salvadore and Sylvester Pagano. This was the same year that the restaurant underwent a complete renovation. Thayer Lutz, Annie’s artist husband, took personal charge of the interior design using copper items in unique decor and installing bells throughout the premises, with the heavy ones placed in the patio garden. Needless to say, each time disaster struck, Annie’s was resurrected. When the debris from Hurricane Camille was cleared away and utilities restored, an on-site sandwich business was opened until other local food dispensers started operating. Then the Lutzes closed down to restore the main dining area and kitchen facilities. In the process, they expanded the dining areas to include the Garden Room, Sun Room, and the Cellar Door only to be struck once more with a calamitous fire in 1972. As if this wasn’t enough, in 1980, a van ran through the dining room’s front wall, causing the establishment to close down for two weeks of repairs. Each time that the place was rebuilt, strong family ties were demonstrated as Annie’s two brothers rolled up their sleeves and assisted in restoring the establishment. In March 1978, Annie’s Restaurant celebrated its 50 year anniversary, hosted by its principal operators; Annie, her husband Thayer Lutz, and her sister Catherine. This was a demonstration of their gratitude to the large family of coastal regulars that dined at Annie’s. They had an open house celebration that was extended to their many regular guests. In 1958, Vaughn Monroe, popular singer in movies and TV, had supper at Annie’s Restaurant and he responded to requests for autographs. Throughout the years other celebrities included Robert Mitchum and Jane Russell. Today, the large, modern restaurant is still uniquely decorated with copper barrels from breweries and copper cheese vats from dairies in the Midwest. The Lounge features seats made from copper vats and above the bar center is a huge copper vat that was brought in from Wisconsin. The main dining room has a ceiling shelf that is lined with hand carved painted duck decoys. In one of the dining rooms hangs wagon wheel chandeliers. There are always several paintings, but in particular the ones that stand out are Santa Clause, Jesus Christ, and “Big Annie.” The dining rooms have open fire places and all year long, strains of music add an ambiance of soulful comfort. For years, the bells in the courtyard have peeled for many special or personal occasions. In particular they ring out the old year and ring in the new year. Birthdays, engagements, anniversaries, and even new babies are reason enough to hear the chimes and gongs issue forth from one or a cadre of the seven large bells that are assembled. In revealing her lifestyle to a local reporter, she recounted that the restaurant has been her entire life. Starting as a young car-hop and even having met her artist husband Thayer Lutz, who stopped at the restaurant during a visit from Wisconsin. Annie’s is signaled as one of the most popular restaurants on the Coast. In the 50s it became famous for its Fried Chicken and Spaghetti which is still on the menu. Known for its charm, comfort, and good cooking, the menu lists exquisite cuisine with standard house specialties that include Schmedje Shrimp Royal and Peggy’s Beer Batter Shrimp. Annie Lutz operates more than a restaurant. It is a tradition manifested by stalwart courage and remembered service with sincere warmth towards its guests. As the sole operator today, Annie very seldom misses a day of work. Even though she has a dedicated staff of service personnel who have stayed their posts for many years, Annie makes her rounds in greeting her guests at each table, either to pass a story or just to welcome them and to acknowledge her gratitude.